Despite the call for reducing waste generation, the amount of waste seems to keep rising all around the world, placing burdens on our landfills. Landfills often need to be expanded, reopened following a period of consolidation and finally capped once the landfill is entirely full. Landfill is not just a waste dump, it's a living organism arising out of constantly changing geotechnical issues. It is logical for the process of landfill closure and its return to the environment to be strictly regulated so that there is no leakage of hazardous emissions in the future. We believe that there is a long-felt need in the development of regulatory documents, on the construction and reclamation of solid household waste landfills, to be based on the use of the state-of-the-art technology. It should be applied not only for environmental but economic reasons as well. Maccaferri has developed effective engineering solutions for construction of new and reclamation of existing solid household waste landfills. The impermeable membrane lining package is one of the most important elements of the waste landfill, because it protects the underlying soils and ground water from pollution. The composite system consists of geodrains and geomembranes of at least 2.0-2.5 mm thick. Our MacDrain W geosynthetic composite materials are recommended for use as drainage layers within the cell, as they are able to replace the traditional gravel drains made of natural materials. Replacing these thicker gravel drains with a thin, lab-tested drainage geocomposite is not only easier to install, but as enables and increase in landfill capacity. Solid household waste landfills are often located near residential areas, so it is necessary to limit the landfill body size. The use of Terramesh, Green Terramesh systems for soil reinforcement are used to steepen the side slopes of landfills, or landfill cells. 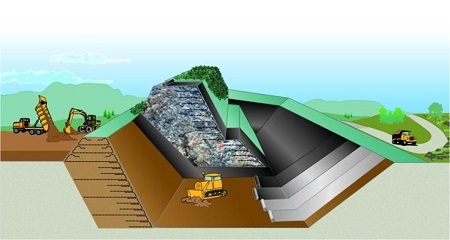 This increases the landfill capacity due to increase in the slope angle compared to an unreinforced soil slope, and thereby reducing the footprint of the cell wall. MacGrid and ParaGrid geogrids to reinforce soil slopes and cell walls, minimising land-take and maximising the available landfill volume and safety of the slopes. 2017 has been announced by the President of the Russian Federation as the year of ecology, it will be the best time to turn everyone's attention to the environment of the country. Please contact us to find out more about Maccaferri.